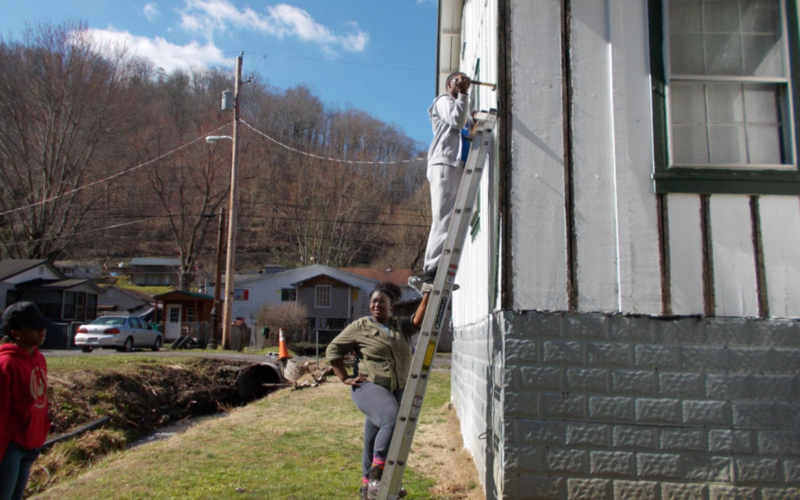 In March, a total of 48 students from the University of Richmond, Notre Dame University and Rider University spent their spring breaks in McDowell County, West Virginia instead of on a beach in Florida or skiing in Colorado. For several days each, these young men and women got up early, worked hard all day and slept in bunk beds in a dormitory in a former high school – all to make for a better home for a stranger. Each year, Americans Helping Americans® partners grassroots organizations in rural Appalachia, such as Big Creek People in Action, to assist them on their home rehabilitation projects so elderly and disabled homeowners can remain safe in the homes they love. These dozens of students worked to lay laminate flooring in the living room of Christy, a mother of three with severe diabetes and other health issues. They repaired the kitchen floor of Melinda, whose husband has a serious illness and their son has been diagnosed with Asperger’s Syndrome. For Shelly, who survived cancer once and is battling it again for second time, they tore out her rotting kitchen floor and replaced it with a new one with new linoleum. None of this would have been possible without the supporters of Americans Helping Americans® who made it possible for us to provide the funding to Big Creek People in Action, making it possible to buy the linoleum, insulation, sheetrock and other materials necessary to the do the job. This month, Big Creek People in Action has a church youth group coming in this month to replace a leaking roof for a disabled couple on a fixed income who never could afford to have their roof fixed on their own. And through August, school and church groups are scheduled to come to McDowell County to lend a helping hand and today we are asking you to help our fellow Americans with a gift that leads to people like Christy, Melinda and Shelly being able to stay in their homes.